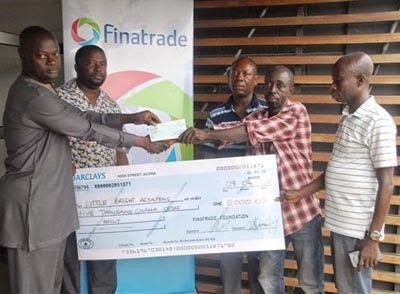 FINATRADE FOUNDATION, a subsidiary of the Finatrade Group of Companies has helped to restore the sight of two-year-old Bright Agyapong who was earlier diagnosed with a bilateral eye swelling. As part of their corporate social responsibility, the foundation paid the entire medical bill valued at GH¢5,000 for Bright’s treatment. The Executive Secretary of the foundation, John Awuni, during the presentation stated that they decided to foot the entire medical bill to ensure that the little boy recovers fully from the ailment. He added that under the circumstances, the foundation realised that a timely intervention was needed to reverse the situation immediately in order to save the sight of little Bright. The foundation, established about a decade ago, has been supportive of such vulnerable groups in society. “We have special interest in supporting such needy people because a life saved could possibly become a corner stone for the nation in the near future,” Mr Awuni said. He, however, disclosed that the foundation was optimistic little Agyapong would recover fully to enable him to have the best of life and also contribute his quota to Ghana in future. According to Joseph Agyepong, father of the boy, the swelling made it impossible for his son to see. A letter from the Korle-Bu Teaching Hospital signed by Dr Laryea on behalf of Dr Segbefia, consultant haemoncologist, said little Agyepong was admitted to the hospital on March 10 with a bilateral eye swelling which was five months old.